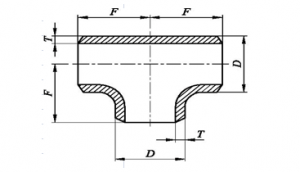 We at Natural Steels manufacture, supply and exporter a diverse range of ButtWeld Tee Fittings, which comes in two forms such as equal tee and unequal tee. We manufacture these tee pipe fittings using stainless steel, Cupronickel and brass and many other material and grades, our range is widely used for connecting pipes of different diameters. 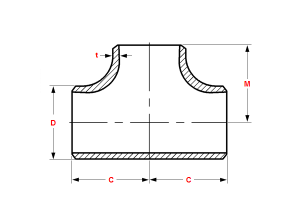 We are highly engaged in providing excellent quality tee fittings that are produced using the latest techniques and quality raw material and in various standard and custom-made sizes, dimensions and finishes to efficient performance to the end users. Our offered range capable of withstanding high pressure & temperature and resisting to corrosion. Our ANSI B 16.9 Buttweld Tee Fittings are used to connect the Pipes of different diameters and change the direction of pipe flow. Clients can avail from us this range of buttweld tee fittings at most affordable prices. Contact us today to request a free and instant quote! Natural Steels is one of the top manufacturers and suppliers of Pipe Fittings from India. Our prices for Tee Buttweld Fittings are very reasonable. Please click on contact us now button or click here to send your requirement. Natural Steels maintains a high-inventory of Buttweld Fittings and can export them at the best price for Tee Buttweld Fittings. Natural Steels is a leading manufacturer, supplier, and exporter of Tee Buttweld Fittings from India. We maintain a huge inventory of Buttweld Fittings and you can buy Tee Buttweld Fittings at the best price. 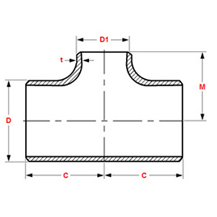 Please click on Contact us now button or click here to send us your complete requirement to Buy Tee Buttweld Fittings from Natural Steels. Exporting Tee Buttweld Fittings to Singapore, Malaysia, Hongkong, Thailand, Indonesia, Taiwan. Other countries includes Afghanistan, Albania, Andorra, Austria, Bahrain, Bangladesh, Bhutan, Brunei, Belarus, Belgium, Bulgaria, Cambodia, China, Cyprus, Croatia, Czech Republic, Denmark, Estonia, Egypt, Finland, France, Germany, Greece, Georgia, Hungary, Iceland, Ireland, Italy, Iran, Iraq, Israel, Japan, Jordan, Kazakhstan, Kuwait, Kyrgyzstan, Lebanon, Latvia, Latin America, Liechtenstein, Lithuania, Luxembourg, Malta, Moldova, Monaco, Maldives, Mongolia, Myanmar (Burma), Nepal, North Korea, Netherlands, Norway, Oman, Poland, Portugal, Pakistan, Palestine, Philippines, Qatar, Russia, Romania, Russia, San Marino, Serbia and Montenegro, Slovakia, Slovenia, Spain, Sweden, Switzerland, Saudi Arabia, South Korea, South Africa, Sri Lanka, Syria, Tanzania, Tajikistan, Thailand, Turkey, Turkmenistan, Ukraine, United Kingdom, United Arab Emirates (UAE), Uzbekistan, Vietnam, Yemen.